Babblings of a Mommy: An iPad/Tablet for kids? Listen up parents, I just found your kids Christmas present! This little device has been named favorite toy pick for Holiday 2010 by Mattel CEO himself. So what is it?? It's the Fisher Price iXL. It's a tablet/kindle/ipad all rolled into one for your little munchkins! It contains small educational apps and activities for kids such as drawing, music, reading, art and handwriting. 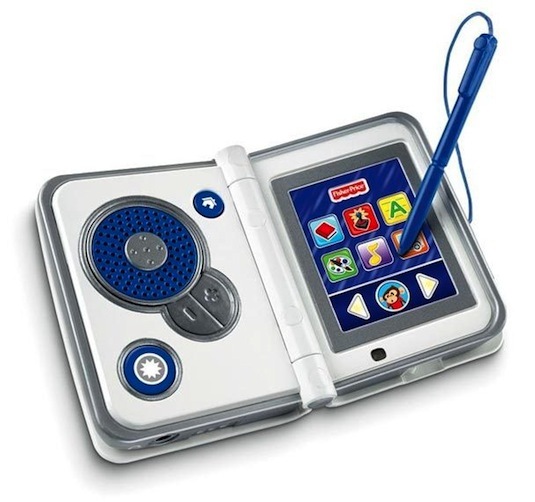 It has a touch screen, a MP3 player, a stylus, an animated story book app. (You can even download additional titles from a online store!) It's capable of being positioned vertically or horizontally and will definitely make learning fun! How cool is that?! Now your kid won't have to beg you to use your electronic devices-they'll have one of their own! The Fisher Price iXL is targeted for kids age 3-6 and will be released in the summer. To find out more information and see a demo video go HERE to Fisher Price's website. What do you think? Will you be buying one for your little rugrats? Let me know! Doesn't it?! I'm excited. I think my daughter is gonna love it too.